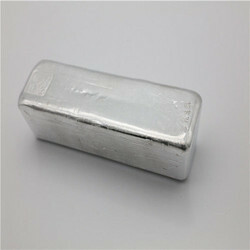 We are a leading Manufacturer of indium ingot from Mumbai, India. The metal is very soft, malleable and easily fusible, with a melting point higher than sodium, but lower than lithium or tin indium is a very soft, silvery-white, highly ductile, relatively rare post-transition metalwith a bright luster. It is so soft (mohs hardness 1.2) that the metal can be cut with a knife, as can sodium. indium is an post-transition metal and chemically, is the intermediate element between its group 13 neighbors gallium andthallium. an indium atom has 49 electrons, having an electronic configuration of 4d105s25p1. In its compounds, indium most commonly loses its three outermost electrons, becoming indium ions, in3+, but in some cases the pair of 5s-electrons can stay within the atom, indium thus being oxidized only to indium(i), in+. This happens due to the inert pair effect, which occurs because of the stabilization of 5s-orbital due to relativistic effects, which are stronger closer to the bottom of the periodic table. in is the more stable oxidation state. thallium (indium's heavier homolog) shows an even stronger effect, making oxidation to thallium(i) more likely than to thallium(iii), making +1 the more likely oxidation state, whereas gallium (indium's lighter homolog) commonly shows only the +3 oxidation state. thus, although thallium is a moderately strong oxidizing agent, indium is stable and indium is a powerful reducing agent.